I’m usually very kind to restaurants I visit, the word ‘dislike’ isn’t something I’d say easily. However, my visit to Heirloom on Bourke St a few weeks ago resulted in an experience that couldn’t be described any other way. Sad, but true. After receiving recommendations from friends, I was sceptical but keen to try this place out. As the brainchild of two talented chefs (Shigeo Nonaka from Shoya and Kyle Doody who has worked in Jacques Reymond and Gills Diner), one would expect a bit more from what we received. 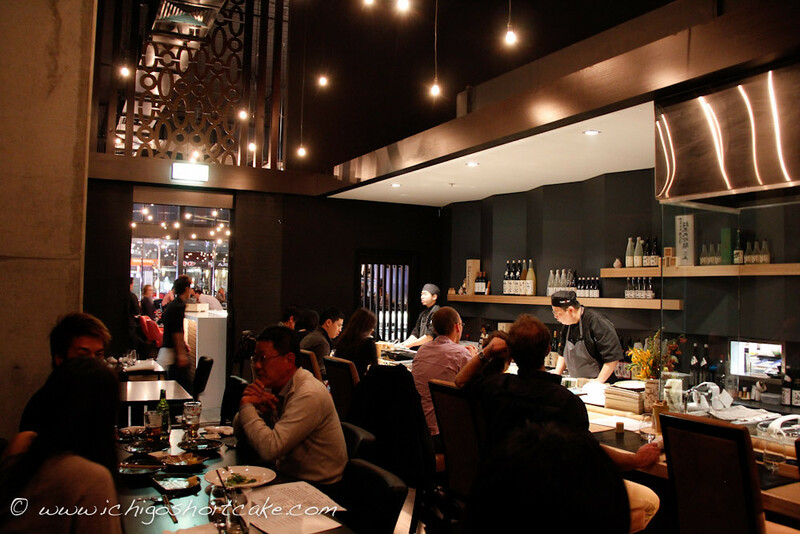 We were nicely tucked away in a little secluded area in front of the sushi bar where we could enjoy fragrant yakitori being cooked. It definitely wasn’t the seating or the atmosphere, I liked those. It also wasn’t the service. 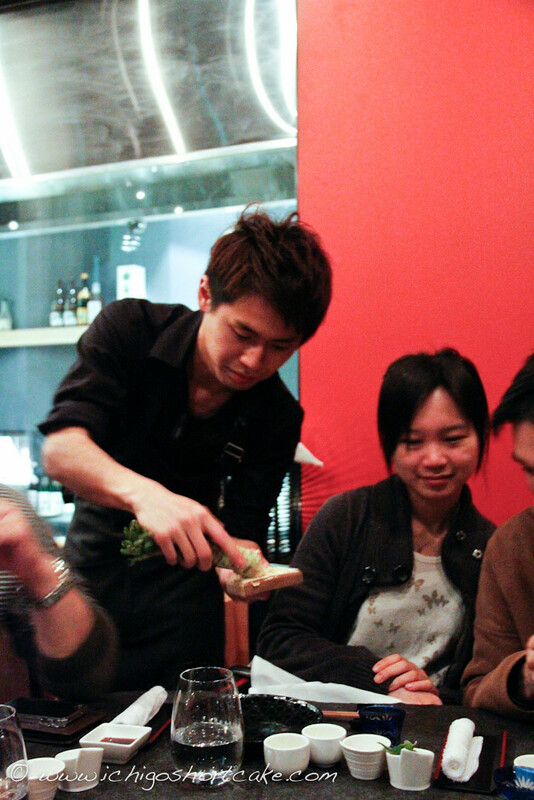 The waiter and waitress came around to our table consistently throughout the night, topped up our water and provided entertainment in the form of fresh wasabi grating. That was probably the most enjoyable part of the night for me. Three free starters were provided for each of us. 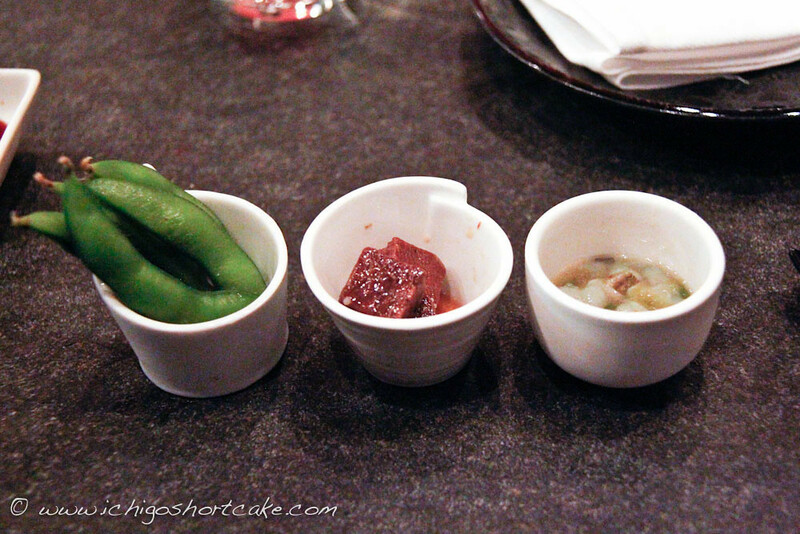 This included (from left to right) edamame, marinated fish (salmon perhaps) and takowasa (squid marinated in a fragrant strong wasabi sauce). Although the takowasa was a bit too strong for me, in no way did I dislike these cute little starters. 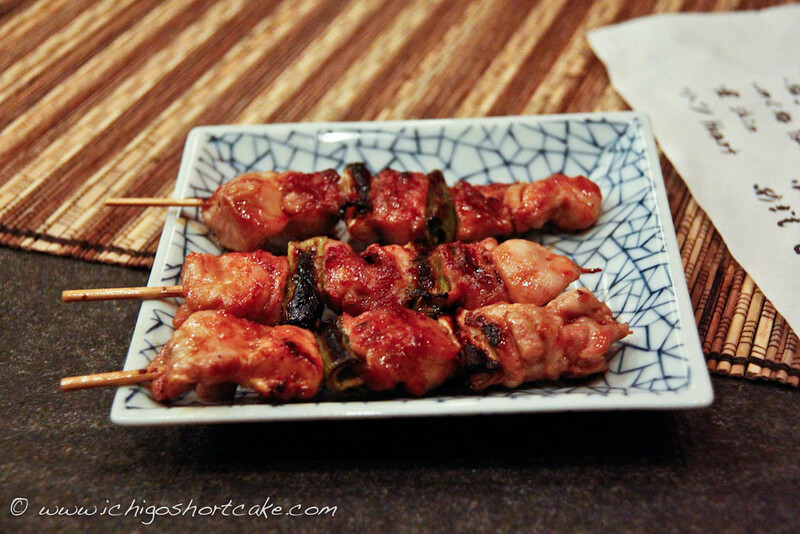 The yakitori was tasty and not too expensive. For $3 each, you get one skewer with 3 pieces of tender chicken and negi in between, grilled on the charcoal grill just next to the sushi bar. So it wasn’t the yakitori (by the way, we only had one skewer each). We ordered a chef’s omakase sashimi set. Now it’s getting to the expensive end of things. For $70 a plate, what we got was below. We ordered two plates between the 12 of us so each person only really got the better of 4-5 pieces each. Mind you, most of the sashimi pieces were tiny. However, as they were quite fresh, this wasn’t enough to tip it over for me. Now for the star of the night – the sushi nigiri. This is what ultimately stole our enjoyment away. Without even knowing what they cost, I thought to myself, they tasted…not too dissimilar to that of sushi at the retail chain Sushi Sushi. It was just that little bit better. I thought the rice was a bit hard and definitely too much of it compared to how much sashimi we got on top. “The sushi was $5.50”, my friend said to me. I thought to myself, $5.50 is reasonable although still slightly expensive for sushi of that standard. It turned out that I grossly misunderstood what “$5.50” really meant. It was actually $5.50 for EACH piece of sushi, not for the set of three. The fish wasn’t anything special, just the usual salmon, tuna and kingfish. 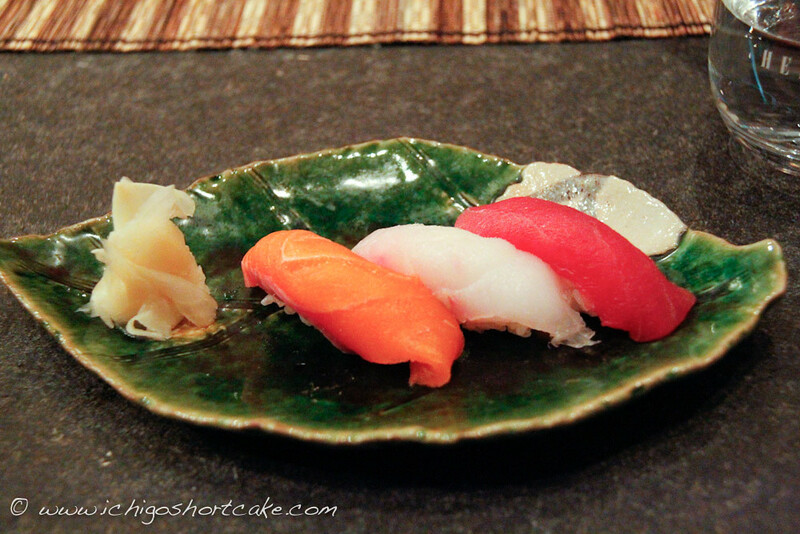 Sushi at Shiranui in Glen Waverley only cost me $9 for a plate of 2 and they were absolutely divine. I was not happy. We had only begun our meal at that stage. What we ordered was meant to be entrees to be followed by a main each and maybe even dessert. However at that point, when people started to realise how expensive it has gotten, no one had the appetite for any more. One yakitori, 3 measly pieces of average sushi nigiri and a few pieces of tiny (although reasonably good) sashimi, we paid $32 each. This is not even including drinks. Oh, I forgot to mention that a few friends decided to share a bottle of sake together. The bottle cost $170. Just a bit overpriced compared to the $20 bottles we recently brought back from Japan, but my friends did say it was beautiful. After the shock and horror of finally getting the bill, we crowded around outside for decisions on what to do with the still grumbling stomaches. 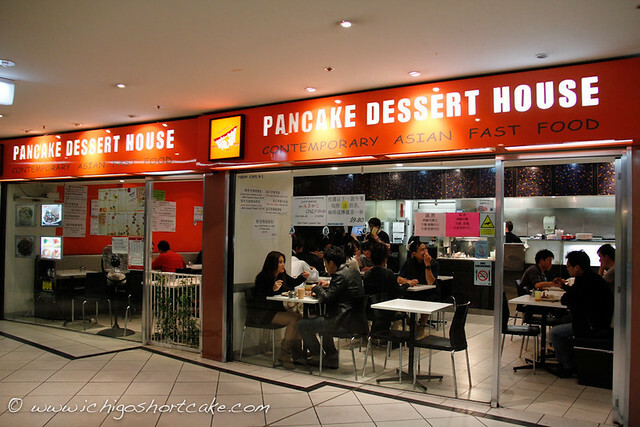 No one really had good suggestions so we ventured across the road to Pancake Dessert House, a cheap option to even out the total cost of the night. 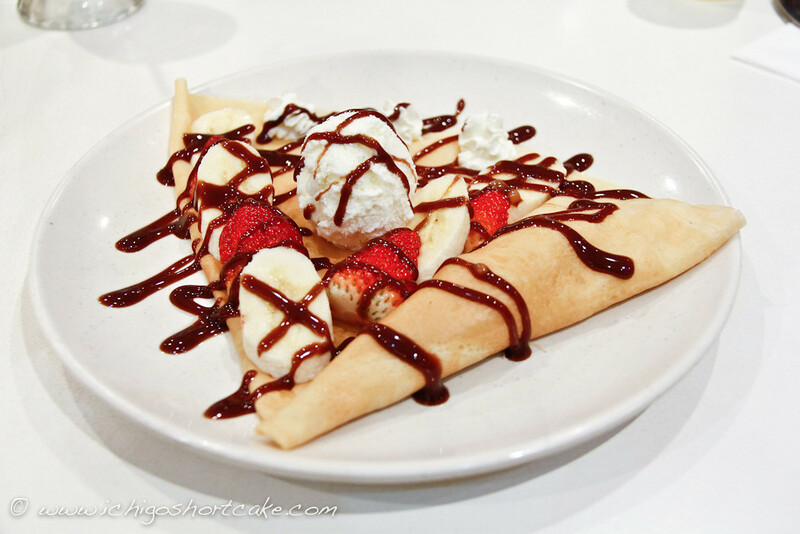 For around $7, I ordered a strawberry and banana crepe. Just $7. 🙁 It was already 10pm by then so I didn’t want something too filling. 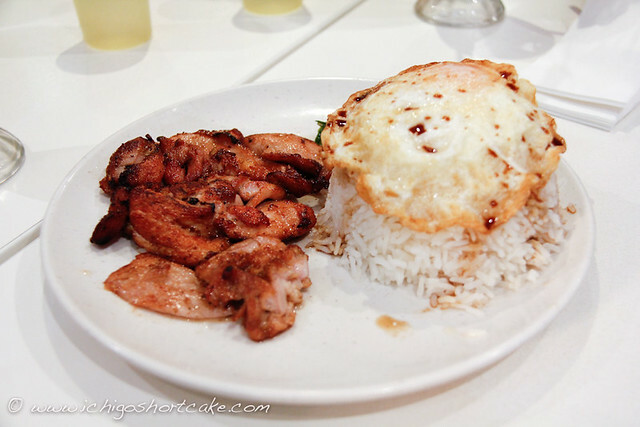 Yuye went with the grilled lemongrass chicken, also for under $10. 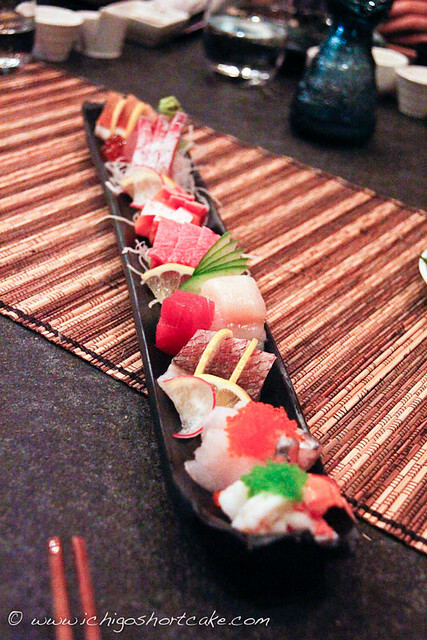 This dish would have gotten less than 2 pieces of that sushi nigiri. It’s possible my opinions may have been different if we had tried Heirloom’s Japanese-French fusion dishes. Some of the desserts and mains looked quite nice from photos. Now the damage has been done and Yuye vows to never go back there again, neither would I frankly. If you’re already planning a trip to Heirloom, by all means don’t let me hinder you. However, if you’re trying the Japanese dishes, just be wary of the costs. @Not Quite Nigella, yes the hard rice was one element I disliked, but I think the contributing factor was more how stingy they were with the fish. If we had a generous serving of it, maybe it would have been less unhappy. it makes me not really want to go there. i can't afford it :(. can't wait to try saikura kaiten sushi.